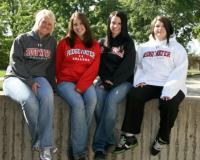 The Ridgewater College Foundation awards approximately $200,000 in scholarships to students each year. The Foundation also provides support to our college programs and departments. From Highway 12: Take County Rd 5 north; turn right on 15th Ave NW. From Business 71: Go west on Cty 24; turn left at T onto Cty 41; turn right onto Cty 24/15th St NW (follow signs).